Welcome to the KYACHW website! The first board meeting was on January 14th from 11:00 am-1:00 pm. That meeting was held at Cattleman’s Steak House, 304 Silver Lake Drive, Mt. Sterling 40353. The March 13th KYACHW board meeting will run from 10:00-11:00 am and the full association meeting will follow from 11:00am-2:00pm. Location Montgomery County Health Department, 108 E. Locust Street, Mt. Sterling, Ky., 40353. We will hear reports from each of the committee chairs. Special guest speaker Kristal Hankinson will be speaking about Trauma Informed Care. Don’t forget Angela Cooper from Voices of Health will be set up to video anyone that would like to talk about being a CHW. These short segments will be on a big screen during our 4th Annual KYACHW Conference. The May 21st KYACHW board meeting will run from 12:00pm-1:00pm and the full association meeting will follow from 1:00-2:00pm. Location TBA. SAVE THE DATE! 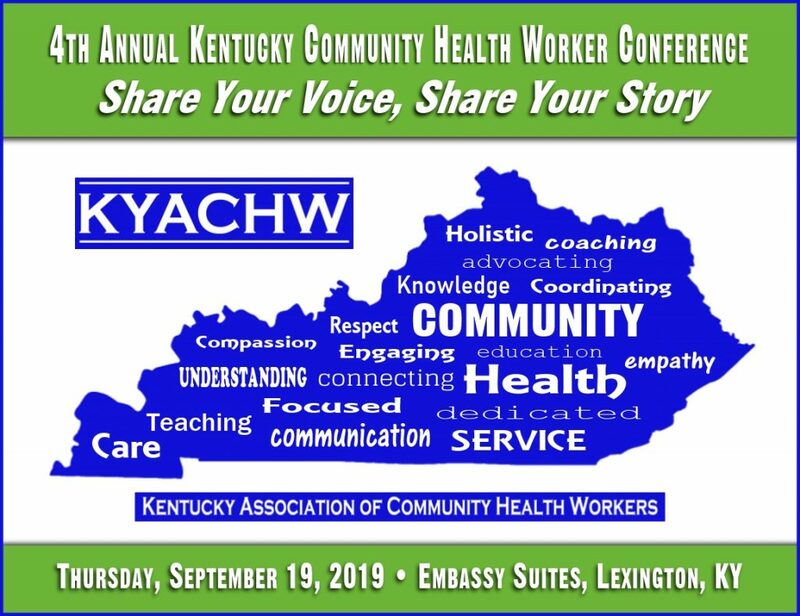 This year’s conference will take place on Thursday, September 19th at the Embassy Suites in Lexington. More information and registration info coming soon! 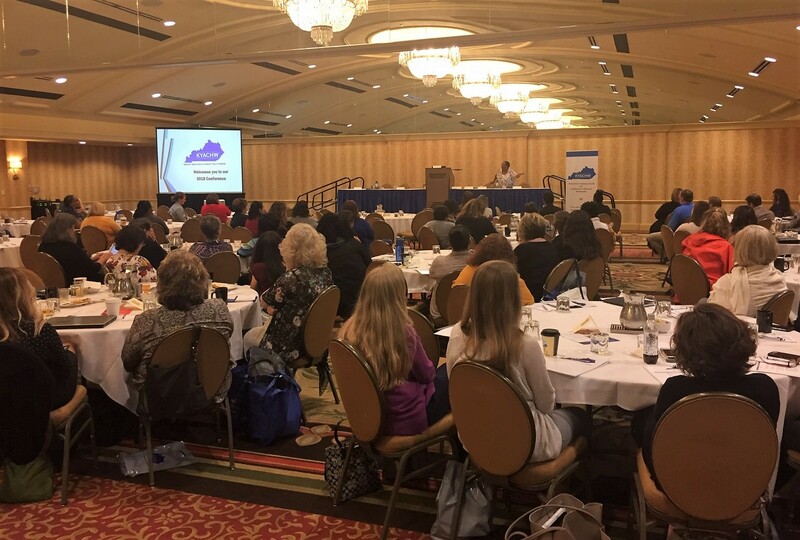 Looking forward to the 2019 Conference? 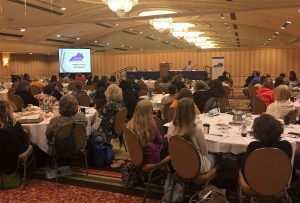 Here’s info from the 2018 conference! Omope Carter Daboiku gave an energetic and informative keynote address to kick off the day. 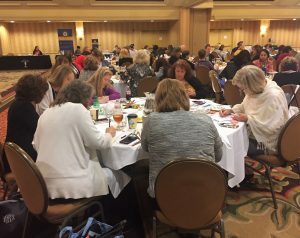 The group participated in an exercise geared toward reducing stress. 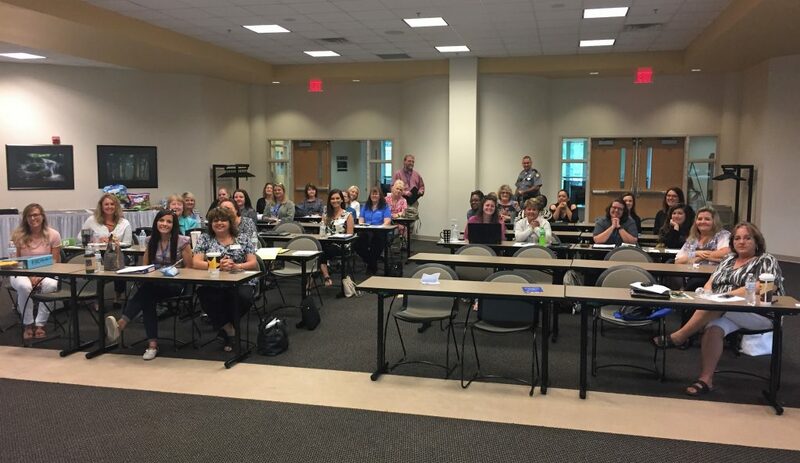 The meeting was held on June 11 at the MSU Regional Enterprise Building located at; 151 University Dr., West Liberty, KY. (The Morgan County Public Library & Gateway Head Start are also located in this building). The KYACHW board meeting ran from 10:00- 12:00 and the full association meeting followed at 1:00-3:00. We heard reports from each of the committee chairs and had a special guest speaker from WellCare. 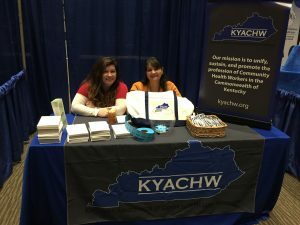 Attendees at KPHA were able to stop by and visit the KYACHW exhibit table! 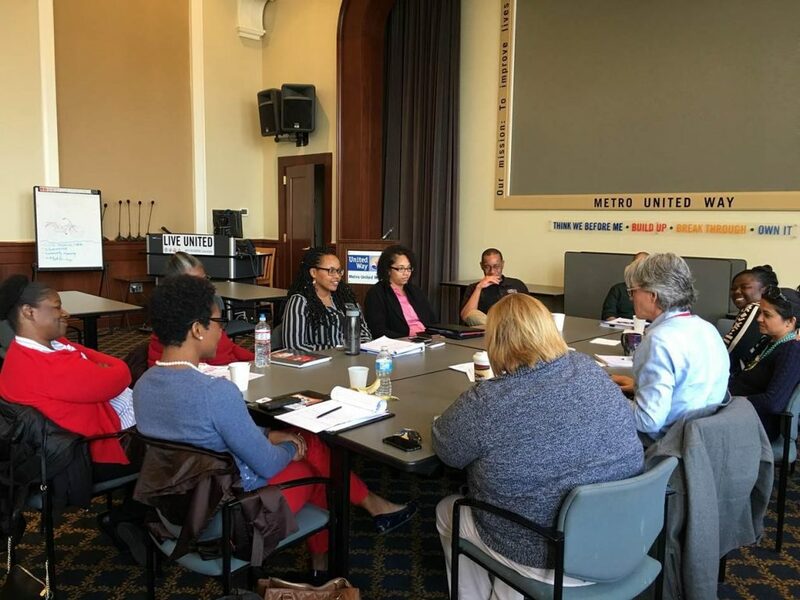 On April 10, 2018, ten Community Health Workers representing seven Louisville programs were convened at Metro United Way as a Focus Group to discuss the “Basic-essential needs of the urban community in Louisville”. 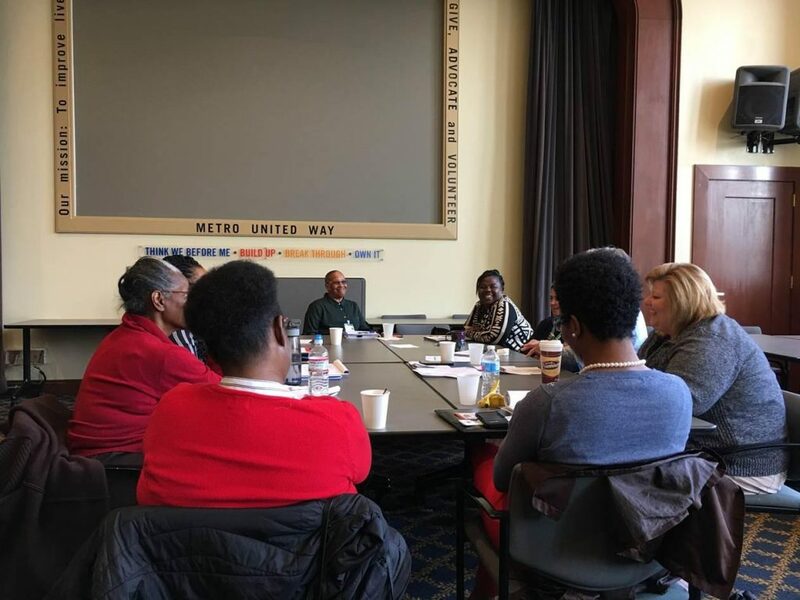 The group was convened as a sub-group of the LHAB (Louisville Health Advisory Board) to discuss and share observations related to the basic needs, resources, barriers and thoughts for the future. Information from the Focus Group will be used in the development of community improvement strategy. KYACHW members gathered at the first quarterly meeting on March 22, 2018. 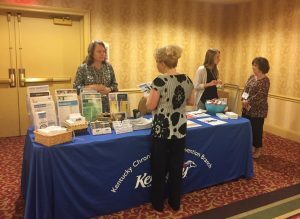 Thanks to each of you who were able to attend first 2018 KYACHW quarterly meeting on March 22, 2018. It was great a turnout with very informative presentations. Thanks to Liz Edgehill and Emily Beauregard for their thought provoking, educational presentations on Health Insurance Literacy and the Medicaid Waiver. 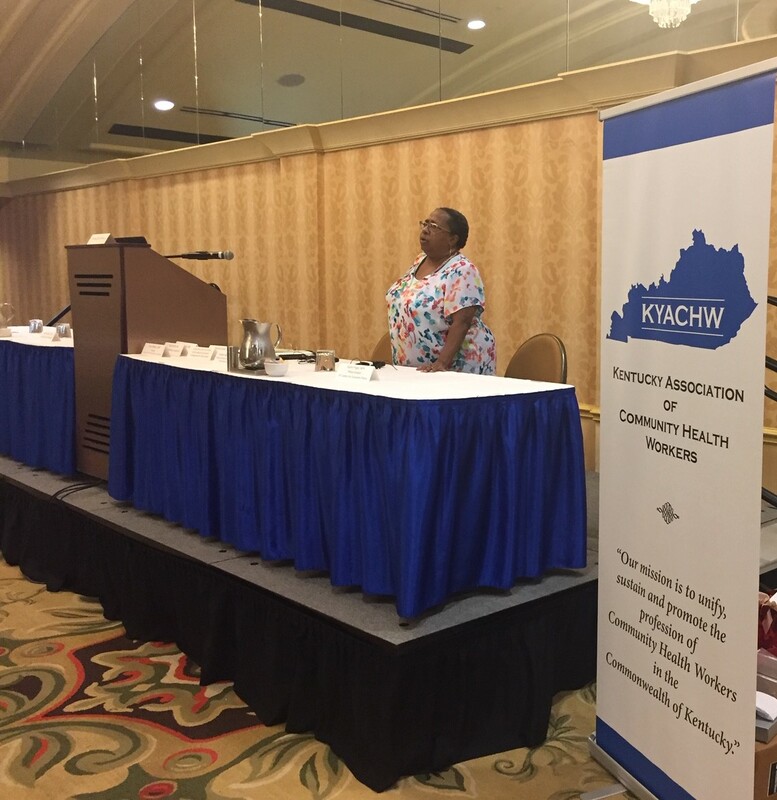 Also, we’d like to thank, Jan Chamness, for sharing the developmental history behind the Network and how the CHW State Advisory Group and the KYACHW began. It was great to have the resourceful, Bev Beckman, and her Louisville team of CHWs, as well. We will be sending out the call-in/login information for the Medicaid Waiver Webinar we discussed, along with the details for our next quarterly meeting in June. This is a reminder that 2018 Membership fees are now due. If you are not already on a committee, please visit our Membership page for details on how to get involved.